A fine tapestry panel. Brussels, circa 1560-1580. 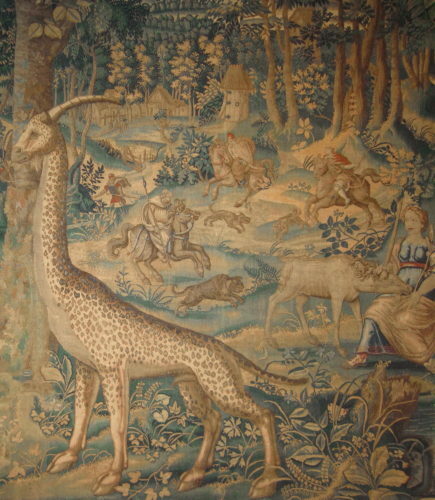 Worked in silks and wools with a woodland scene populated with a giraffe, huntsmen on horseback, and the image of the virgin and unicorn. The form of the giraffe appears to be based on the woodcut used to illustrate Konrad Gesner's 'Historiae animalium' of 1551–1558. 6'10" (208cm) high and 6'0" (183cm wide. 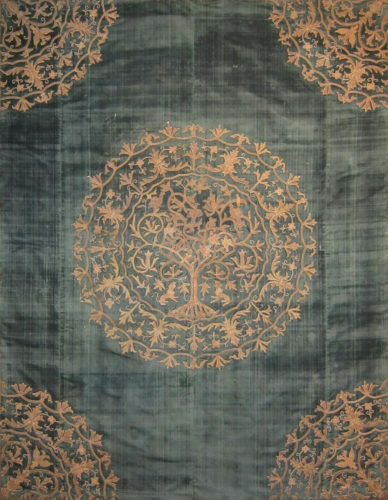 An Indo-Portuguese hanging, circa 1700. Of blue silk velvet with appliquéd metal thread embroidery. 6'9" (206cm) high and 5'4" (163cm) wide. French needlework chair seat and back (detail), circa 1720-1740. Worked in silks and wools, the figures and animals in petit point. A giant leaf tapestry fragment. Southern Netherlands, circa 1550. 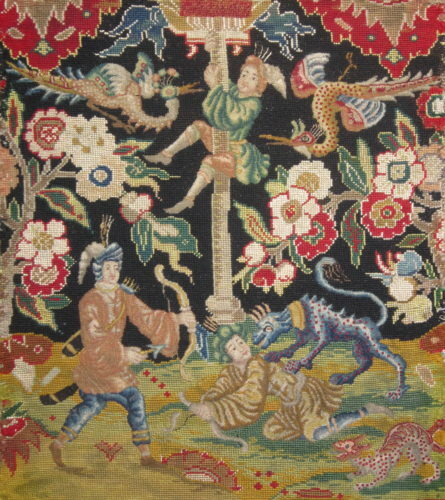 A very similar complete tapestry, of comparable height and 310cm wide, is in the collection of the Musée des Arts Decoratifs, Paris (inv no. 38055). 10’11” (333cm) high and 4’10¼” (148cm) wide. European textiles of the period spanning the 16th century to the 19th century. Tapestries, needlework, crewelwork and other embroidery, silks, velvets, appliquéd and printed textiles, curtains, cushions and passementerie.